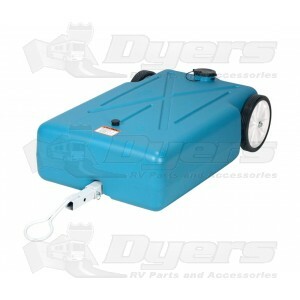 Portable polyethylene gray/black water holding tanks include large 10" rear wheels. 5' sewer hoses, quick release pins, and tow handles to use with any hitch ball and dump kit. Height of Tank Body: 11"
Height to Fill Cap: 11-3/4"
Shipping was fast from Dyers. Even with Shipping cost Dyers was a few dollars less than Amazon's free shipping. The tank and wheels seemed strong when I filled it with water to check weight. But water was soon all over the deck. I removed the white bottom steel plate and found one of the threaded inserts had water leaking out but was tight and firmly inbeded. Drained and dryed the tank. Used clear silicon sealant to fill the thread holes and a bead around every threaded insert. Refilled with water the next day and no leaks. I had been using my daughter's for the past year and knew it was a must have! Delivered on time in perfect order. Freight was a little high. No local dsitributors, Camping World switched to another brand, not as good!